MARJAH, Afghanistan - Like tomb raiders, the Marines unearth the deadly treasures of those who no longer rule Helmand province. Scouring dry creek beds and abandoned compounds, they collect caches of AK-47s, Soviet era grenades and homemade explosives buried by the Taliban. First Lt. Shane Harden, the Fox Company executive officer, noted a significant decrease in Taliban small arms attacks since the beginning of the deployment. Harden said firefights used to be a daily occurrence. Now, he said, more than two weeks have passed since their last engagement with the enemy. Harden, from Dublin, Ga., believes the decrease in violence is directly related to the increase in cache finds. Koury, whose company supports 3rd Battalion, 9th Marine Regiment, said the turnaround in Northern Marjah is the byproduct of a change in command philosophy. The former battalions focused more on destroying the enemy, whereas 3/9 and Fox Company have concentrated more on building relationships with the locals, Koury said. Harden noted that Fox Company and 3/9 face a weaker enemy than past Marine battalions in Marjah – units that adopted a more aggressive approach by necessity, he said. He conceded that Fox Company's approach wouldn't have been possible in the spring of 2010, when local Taliban forces were a more formidable threat, and he credited previous battalions for aggressively pushing lingering Taliban out of Marrjah and setting the conditions for more sophisticated counterinsurgency operations. Nevertheless, he said, Fox Company saw no progress until a point early in the deployment when they shifted their focus from killing the enemy to embracing the community. In Northern Marjah, the people will, asserted Koury, because the Fox Company Marines have avoided endangering the civilian population in pursuit of insurgents. Sgt. Gerry Cariaga, a squad leader with Fox Company, said he’s surprised at how much of the deployment he’s spent talking to people and searching for buried weapons. He said departing Marines from the last unit warned that violence would resume with the changing of seasons. Cariaga, from Solsona, Ilocos Norte, Phillippines, said he’s sometimes disappointed by the unfulfilled prophecy. He sometimes misses the excitement of the firefights, he admitted, but overall, he’s glad that his company has found a safer, more effective way to operate. “If you treat people with respect, they will respect you,” Cariaga observed. Koury attributes the company’s success – the uncovered caches, burgeoning public support and reduced hostility – to Marine discipline. Marines prefer the gallantry of combat to playing the role of neighborhood watch, but they will always restrain their natural aggression for the sake of mission accomplishment, he said. Leonard Burke is used to wearing green. After all, his parents were Irish. And, he just celebrated his 93rd St. Patrick's Day. 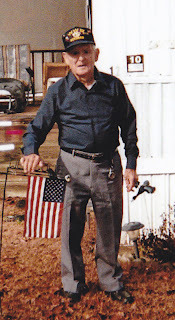 Although Leonard may look green on the outside - he wore the olive drab uniform of his country for six years too- on the inside, Leonard Burke bleeds red, white, and blue. So, at this Saturday's St. Patrick's Parade, look for this passionately patriotic veteran, one of the many grand marshals we salute for their service to our nation. 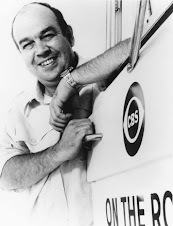 Leonard Burke was born to Joseph Patrick Burke and Sarah Jane Eckert Burke in Pennsylvania on the tenth day of the tenth month of 1918. Six weeks after his birth, Joe Burke began making preparations to come home from World War I. Leonard Burke grew up in the Great Depression on the back streets of a West Philadelphia neighborhood, where most of the residents were Irish or Italian. Leonard never finished high school, opting to start working instead. He worked at Dewey's Restaurant on 13th and Market streets for $18.00 a week, keeping $5.00 for himself, and giving the rest to his mother as long as he was living at home. When the war with Japan broke out, Leonard left his managerial job at Dewey's and took a job as a ball bearing grinder at SFK Ball and Bearing Plant, where he made bearings for ships, tanks, and trucks. When called into the service in 1943, Leonard, at the age of twenty-five with a wife and infant daughter at home, enlisted in the Army. Naturally he was assigned to an engineering unit. 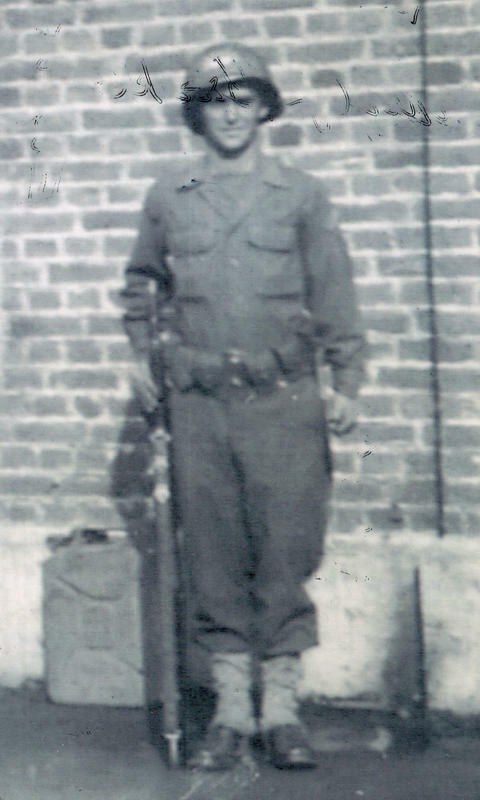 After training for many months in the states, Burke and his unit arrived in Liverpool, England in mid-May of 1944, just weeks before D-day. 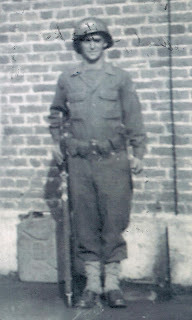 Leonard was assigned to the 300th Combat Engineers. For eighteen months, Leonard built roads, mine fields, bridges, fortifications, and anything else the Army needed to build or blow up as it slowly moved across France and Belgum into Germany. During the bitterly cold winter of 1944-45, Burke's unit saw service just north of the Battle of the Bulge. One of the highlights of his service was the day Leonard literally bumped into Gen. George S. Patton. When Burke saw whom he had bumped into, he apologized. The immortal general excused the momentary brush. Leonard never can get out his mind the sight of piles of bones in the killing ovens of the concentration camps he saw near the end of the war. During his tour in Europe, Burke was awarded five bronze stars, a meritorious unit award, and various other awards. Seeing it as a jinx, Burke turned down a Purple Heart instead telling his general to give it to the guy in the bed because he was in worse shape. After the war was over, Burke was one the lucky ones when he got old job back. But, after six months, Leonard decided to join the Army Air Corps to ensure a steady income for his family. Among Leonard's highly prized memorabilia of his years in the service is a certificate issued to him by Col. John R. Kilgore. Burke participated in Operation Sandstone at the Eniwetok Atomic Energy Proving Grounds on the Marshall Islands. The project was a three-detonation series of atomic bombs in 1948 to test the effects of nuclear fall out on the atmosphere and naval ships and aircraft. After the war, Burke married the love of his life, his wife Thelma, and moved to Florida. Eventually, Leonard and Thelma moved to Moultrie, Georgia, where he lived and worked until he recently retired. Yes, Leonard worked up until the age of ninety. Burke began working at Lear-Signer in Moultrie in 1951 and kept on working full time in the aviation industry. At the age of seventy-three, when most people his age have already retired, Leonard took a new job at Maule Air, Inc. He would work there for almost 17 years. At the age of 89, Leonard was honored for his work as a quality control inspector as the Older Worker of the Year in Southwest Georgia. Today, Burke lives with his step daughter Elaine Goolsby on Walke Dairy Road. His memories of his life in World War II are still vivid in his mind. He treasures the friendships he made and the good he was able to do on behalf of his country. I imagine, if the U.S. Army called and needed his help, Leonard Burke would put his green uniform back on, stand at attention, and salute the flag of the country he so dearly loves. 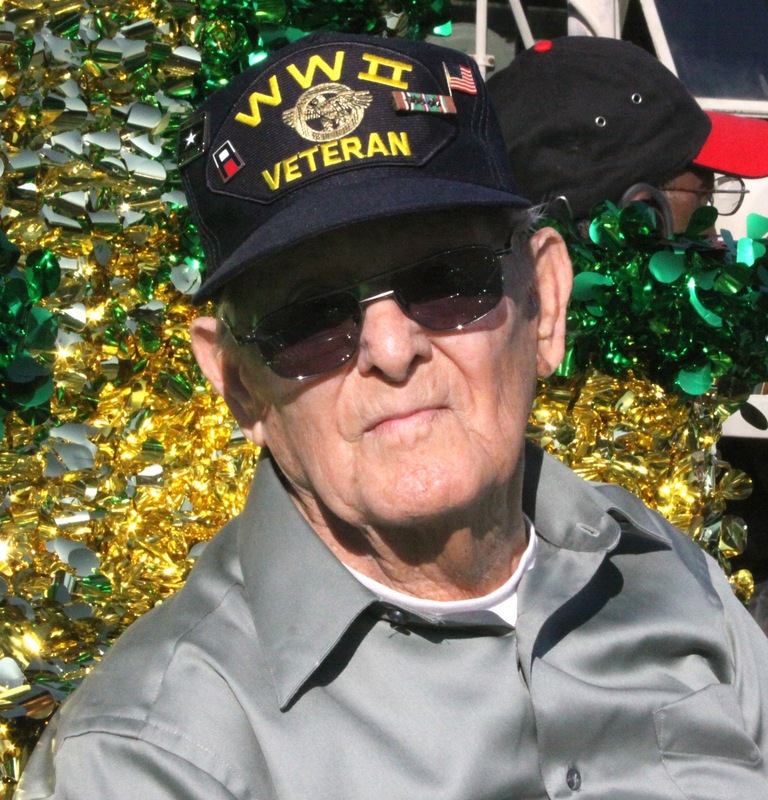 The Dublin Civitan Club invites all veterans of military service to serve as grand marshals of this year's parade. If you are a veteran and would like to walk or ride in the parade report to the head of the parade column at S. Jefferson Street and Martin Luther King Dr., this Saturday morning between 08:30 to 09:30 hours. If you can't make it, the Civitan Club thanks you for your service to our country. To those who come to watch the parade, bring your flag to wave as we honor those who risked their lives to give us the freedoms we enjoy today. For further information, please call me at 478-279-2514. Leonard Burke riding aboard the VA float, St. Patrick's Parade, March 19, 2011.